Morocco Permaculture Society is a Society under Irish common law. It exists to promote permaculture in Morocco and to help Moroccans who wish to improve their lives by adopting permaculture techniques. You do not have to be a Member of the Society to join and use this website. These articles are in English. They do not apply to the Beneficiaries of the Society’s work, and users of the facilities provided by the Society are neither affected nor bound by any of these items. Morocco Permaculture Society (A Society under Irish Common Law) is a network of individuals dedicated to the promotion and propagation of permaculture principles in Morocco. This is primarily achieved by providing internet access, communication facilities, and assistance in their use. 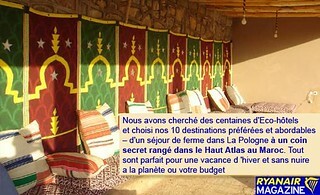 The Beneficiaries of the Society’s work are the people in Morocco doing permaculture or wishing to learn more about it. The Members of the Society are those providing assistance, both material and practical, in the provision of the Society’s services. It is not necessary to be a Member in order to contribute. Membership of an Irish Common Law Society need not be 100% Irish, thus Membership is open to all. Members apply to join the Society by stating to existing Members that they wish to join and offering their skills and/or sharing of assets as a contribution. Membership is completed when they make their first contribution and that contribution is appreciated and accepted by other Members. Members can leave at any time, by stating that they are leaving to the other Members. Members may not be recipients of any income from the initiatives outlined in (3.2.) below. Members may also be Beneficiaries. Members may not under any circumstances represent the Society in any political matter of any kind. The Society has no political, religious or philosophical stance and cannot be used by Members to enhance their status in any argument or presentation which is not within the scope of (1b9). All contributions to the efforts of the Society are given freely and without financial reimbursement. Individuals may provide their time or the resources they have access to without fees or expectation of financial reward. The Society does not accept financial contributions of any kind. The Society has no financial income whatsoever, thus there is no need for Society accounts. Facilities provided by the Society may assist in providing income to any of its Beneficiaries who are not also Members (see 1b7). For example, a website provided by the Society may carry advertisements from a network or an individual business. Such income shall be set up in a way that ensures the income goes directly to the Beneficiaries involved, and not through the Society. Full Accounts of any such income shall be published on the Maroc Vert website http://marocvert.net/ along with proofs. Beneficiaries must agree to (3.4) as a condition of being eligible to receive such funds. The decisions as to who shall receive funds from any such venture are to be made by consensus among Members and Beneficiaries. No consensus – no venture – no funds. Society Members are always responsible for their own actions, and for the results of those actions. One Member is not responsible for the actions, nor for the consequences of the actions of another Member. This is not a rule, but a simple observation of the mind-numbingly obvious, and the fact that we need to include it here speaks volumes about the state of our world. Membership of the Society infers no special rights beyond those a Member had before becoming a Member. With the exception of (1b7) above, Members do not relinquish any rights by becoming a Member. Morocco Permaculture Society is a peer-to-peer network of free individuals collaborating. There are no Officers. Specialization is taken on voluntarily by those with the skills and inclination. Disputes between Members, between Beneficiaries, and between Members and Beneficiaries shall be resolved by adult consensus. Failure to achieve consensus means failure of whatever part of the project is being disputed. One side winning by force of authority does not produce a solution, thus the Society provides no mechanism for a rule to be imposed. The dispute must be resolved without coercion or not at all. Disruptive individuals shall be removed by default due to the lack of cooperation from other Members. Updated and web version created: Aug 27 2017.